The Parliamentary Standing Committee on the Public Accounts will conduct another Public Hearing at 2.30pm on Thursday [Feb 2] at St. Paul’s, where Craig Mayor who will give a presentation regarding the financial impact of the airport project. “The Parliamentary Standing Committee on the Public Accounts will conduct another Public Hearing on Thursday, 2nd February 2017 at 2:30pm at St. Paul’s Church Centennial Hall,” the announcement said. 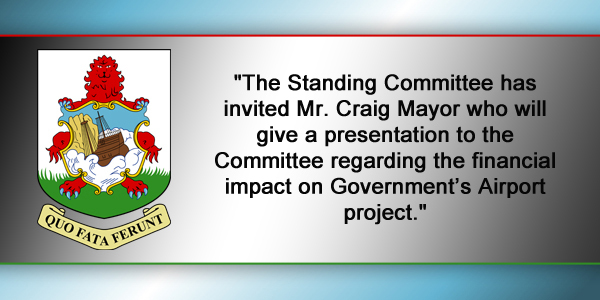 “The Standing Committee has invited Mr. Craig Mayor who will give a presentation to the Committee, regarding the financial impact on Government’s Airport project. “The Public Accounts Committee is comprised of Members of Parliament and is authorized by the House of Assembly to closely examine and report on matters relating to the accounts of the Government of Bermuda and, in particular, to investigate findings reported by the Auditor General in the Auditor’s Annual and other Special Reports. “The Chairman of the Committee is Wayne L. Furbert. Just curious, what are Mr Mayor’s qualifications? Is he an expert in airport development and financing? He was an accountant. Now retired. That is all that is required from a PLP standpoint. They dismiss all the actual experts and their reports and rely on some unknown accountant to justify their stance. he is an expert witness—happens all the time in court cases–you pay for the side of the story you want for your defense. This is simply the same. He’s a Chartered Accountant and has worked in a number of senior executive positions in the past, so he isn’t to be dismissed very easily. But as far as relevant project management or financing experience, it’s not so clear. Being a CA alone is certainly not enough. There are hundreds of CAs in Bermuda but not many (if any) are experts in project management and financing large public capital projects. I guess I just find it odd that his qualifications have never been fully explained anywhere that I’ve seen. Makes me believe he is not as much of an expert as he and others would have us believe… I stand to be corrected. The Public Accounts Committee is comprised of Members of Parliament and is authorized by the House of Assembly to closely examine and report on matters relating to the accounts of the Government of Bermuda and, in particular, to investigate findings reported by the Auditor General in the Auditor’s Annual and other Special Reports. A clear abuse of the PAC. Where does it say someone with an opinion can present their case before PAC? Well that’s the thing. He’s a CA and a former executive. Craig is certainly a very bright. But he doesn’t really have major project management, engineering or special project financing experience. We don’t necessarily give air time to every bright person that comes our way. I guess Mr Mayor has seen the missing financial module 29. If he hasn’t why should anyone listen to him. We already know what he thinks about it. Also I did not think that this is in the remit of the PAC. While he is there perhaps he can comment on the BIU’s lack of qualified finacials for the past years. Was it 20 years or 18? I can’t remember. In this regard I am sure 2;30 was set so that the NO NO NO crowd would be at a minimum numbers wise? Well it’s going to be the usual rent-a-mob isn’t it. for those supporting the argument against–nothing more. For balance why doesn’t the PLP Chairman invite alternate viewpoints? Seems like to me under Burt’s PLP the PAC has become a partisan weapon. Sounds like the UBP/OBA and their great choice of the “blue ribbon panel” BullS***…. But when the PLP gets a Qualified individual they are qualified for an airport development… But all the accountants on the blue ribbon panel are. How convenient. Did I say he wasn’t qualified. I said that all his original points were rebutted roundly by the Minister. Many of his assertions were wrong as he failed to even to try and contact the Ministry to confirm the numbers he was using in his analysis. So what new information does he have to provide this time? Burt has made the PAC a partisan weapon when it should be an independent body that seeks the best for taxpayers and not a particular political party. If you don’t believe me then as yourself with all the financial shenanigans brought up in the AG’s report why hasn’t these matters been addressed by the PAC as of yet? When are they going to do the job they are supposed to do and stop talking about the airport? I now understand one of the reasons the PLP want the Auditor General to do a report on the airport. It is to justify the use of the PAC to divert attention away from the reports they are supposed to be talking about. It would be one of those Special Reports. Not signs of a party that will be a responsible government, just tricky dickies. I’m not sure this is in the remit of the PAC. Why do we want the opinion of one person (whose view is already in the public domain and was formed before the confidential information was released) rather than a balance of 6 views from the Blue Ribbon Panel which is reporting in a few days? At least Craig Mayor has the testicular fortitude to defend his country against a project deal that will see Aecon claim their $350m profit off a $65m financial injection before we receive our first dollar. You arm chair jockeys spend your useless lives protecting a Government that quite frankly, if they were doing good, you wouldn’t have to defend them as hard as you are. Simply come out of your privileged lives and actually attend a meeting where you can hear firsthand how your Government is trying to take us for a ride of our lives. This deal is NOT about jobs or off balance sheet project. Our airport, our revenue maker will be privatized and controlled by others, while Government will not have a say. There’s so much about this deal that if you really asked pertinent questions, you will see for yourselves. The same way they are hedging their bets on hypothetical new visitor arrivals to earn more money, to repay Aecon, I will bet you that before we make a dime, a recession so terrible will knock the snot out of us. We don’t have any wiggle room with this deal at all. You silly people better hope that this deal doesn’t go through. I hope you will remember this warning!